This is essentially the origin of every supervillain in comic book history, isn’t it? Regular, well-meaning guy has a novel idea for a technological experiment, but something goes wrong. Horribly wrong. 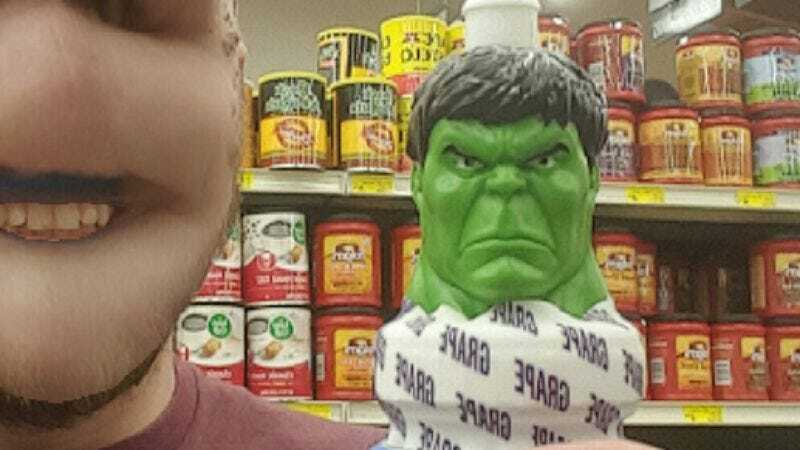 In this case, the regular, well-meaning guy is a Redditor who goes by the name ZaganOstia, and his technological experiment was an attempt to use Snapchat’s face swap feature on a Hulk-headed Good2grow kid’s drink. Behold ManosMan*! He tried using his pocket computer to mix his DNA with the Hulk’s to become super powerful, but a glitch in the system gave him a face full of phalanges and the ability to inflict massive damage with his dynamic head butts. His sidekick is the nefarious Gawking Fist. * The “Knucklehead” joke has been made about 40,000 times.